So you might not make it to Italy this summer – that’s ok, you can take a tour of LibraryThing instead! 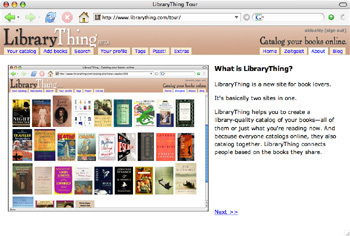 We knew a simple intro to LibraryThing was something we were severely lacking, and inspired by the cool last.fm tour (where apparently, “what you get when you sign up” includes… a pony!) we made our own. We have no ponies. But we’re proud of it anyway.